Blue Cabinets - Yay or Nay? 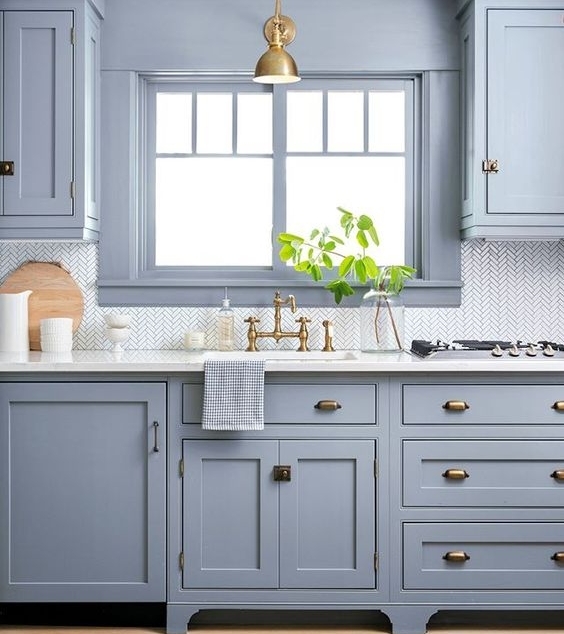 i don't know exactly why, but I have been SO DRAWN to blue cabinets in kitchens and in laundry rooms lately! From light baby blue with gray undertones to dark navy, I am just completely smitten. I feel like it is a good balance of being fun and lighthearted but still sophisticated. I don't think I could ever do it in my own kitchen, though. Maybe if I had a beach house ;) Or maybe I could pull it off in a bathroom or a laundry room. It would definitely have to be the right space, don't you think? Here are some of my favorite blue kitchens/laundry rooms that I've collected over the last month or so. Thank you! Check back for the results soon! And if you said you liked it, I would love to know what shade of blue you'd pick and where! Comment below! I think my first choice would be a light blue/hydrangea blue laundry room.